This e-book, AYURVEDA CAN CURE CONSTIPATION,has been created to stop your worry, anxiety, and fear that you might have about your constipation. Mostly likely, you don't know what approach to take with your have constipation. Taking drugstore laxatives might be the first thing that comes to your mind, but that would be a big mistake. As per Ayurveda constipation is not a symptom,it is a disease, and also a root cause of many diseases. In ayurveda constipation is referred to as Aanaha. Baddha Koshtha or the Koshtabadhata are the other terms also in use. According to Ayurveda, constipation is a result of aggravation of Vata dosha, but sometimes it can also be caused by aggravation of Pitta and Kapha dosha and treatment varies according to dosha aggravation. 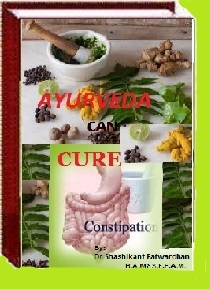 The book "AYURVEDA CAN CURE CONSTIPATION" is a complete and comprehensive guide on the subject. A chapter describes Diet recommendations according to type of Dosha aggravation. Dr. Shashikant Patwardhan is an expert Ayurvedic consultant and has an experience of more than 30 years. He has successfully compiled this complete and comprehensive ebook on Ayurvedic Cure of Constipation. This Ebook is very useful for patients, students, practitioners, researchers and for all of you, who are interested in Ayurvedic Science. For ensuring a safe way to stop and prevent constipation and regain your health, Order Now. We are	offering "Ayurveda Can Cure Constipations" in eBook form! For Indian Residents,other options to Make Payment in Indian Rupees is HERE.